Join NOW and pay no dues until Fall through the Early Enrollment Program! Early Enrollment is an opportunity for you to join your professional organization, the Jordan Education Association, for free until Fall of 2019. You will receive access to most member benefits including ratifying the negotiations package, discounts on goods and services, and limited access to legal assistance until you become a full member on September 1. Join by completing the Early Enrollment Membership Form below, or ask your building AR for more information. KSL did a story on the Jordan District RIS. The JEA Office has been informed by the District that the RIS notification process has been delayed a little while. It is anticipated that all those involved at the District level to approve those teachers being RIS’d will meet on Monday March 11. I’m sorry if you are anxious and still wondering about your position, but we felt you should know why there is nothing being said. • Is the Professional Association for certificated employees of the Jordan School District. • Membership includes the majority of educators in the Jordan School District. • JEA serves as the bargaining agent for all certificated employees of the district. 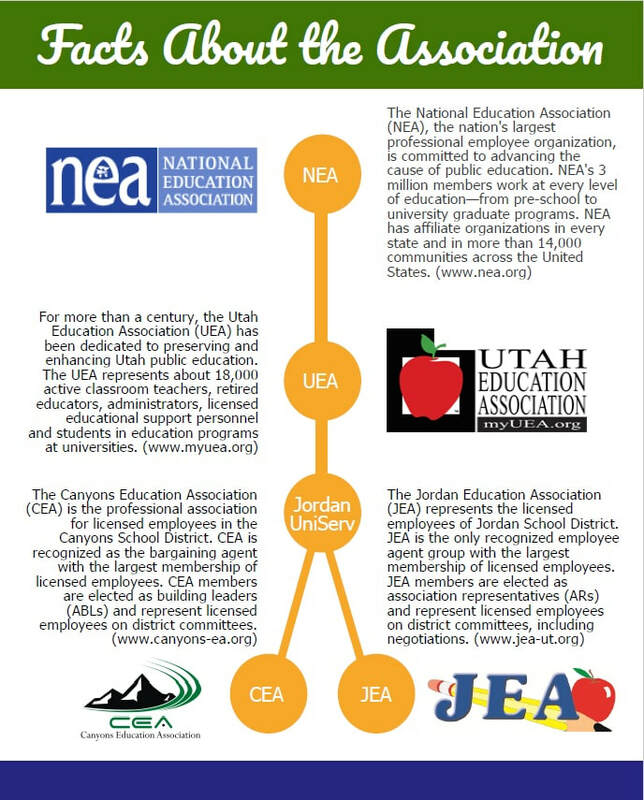 • JEA is an affiliate of the Utah Education Association (UEA) and the National Education Association (NEA). • JEA has an Executive Board which is the governing body of the Association. Each member of the Board is a certificated employee in the Jordan School District who has been elected by its members. * The educational opportunities afforded to students. * The quality of instruction provided to students. * The involvement of parents in their child's education. * The improvement working conditions, salaries, and benefits for the professionals who provide these services. 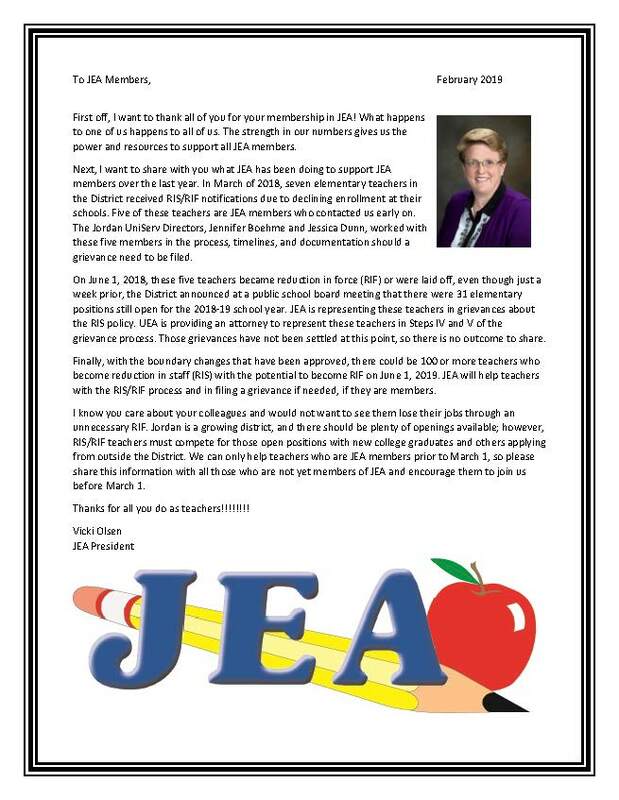 • JEA encourages its members to be involved in the political process by understanding those issues which affect public education and supporting those candidates and positions which will most positively affect the education community.